Why is men‘s fertility decreasing dramatically? Studies show that male fertility decreasing by about a third between 1989 and 2005. Why is this decline occurring? What can be done about it? In a study  in France with about 26,000 couples in treatment for unfulfilled desire to have children, a decrease in sperm concentration of about 32 percent was observed between the period 1989 and 2005. The men had to do a Spermiogram regularly in this study, so the study data are very reliable. While the average 35-year-old man from 1989 still had a sperm concentration of 73.6 million spermatozoa per ml of ejaculate, in 2005 there were only 49.9 million spermatozoa left. As I have described in my article “Voegeli Prevention for Men,“ a man is considered infertile if his sperm concentration is below 10 million spermatozoa. In addition, it can be inferred from the study that sperm numbers per year are decreasing by about 2 percent, meaning that men are currently averaging around 42 million spermatozoa per ml – trend is falling. Even today, this figure is dramatic, because an average always means that there are also many values well below the average. Why has men’s fertility declined in developed nations? Will all men be infertile in 30 to 50 years? What can men do to counteract this development? Why has men‘s fertility declined? More and more couples are only late in deciding for a desire to have children. As I illustrated in my article “The Biological Clock of Man”, the biological clock also ticks for men. Because the quality and motility of the sperm has been shown to decrease with the age of the man. If the men now bear children with less intact sperm, this will affect the quality of the genotype of the next generation. Thus, late fatherhood could be a genetic cause of a decline in men‘s fertility. There are no studies on this. However, it has been shown  that male offspring in particular, who have been artificially conceived by older couples, e.g. through IVF, are more likely to become infertile. In general, many studies show that the risk of disease and genetic defects in children born artificially is significantly higher . Emotional stress from today’s lifestyle can affect the fertility of both men and women. On stress days, according to BzGA , the hormones Prolactin and Cortisol are increasingly produced, which influence both the woman‘s menstrual cycle and testicular function. It is generally known that nicotine , alcohol  and other poisons are not good for male fertility, among other things. In terms of smoking, the impact on fertility is even more significant than previously thought. This was clearly demonstrated by a study conducted from the year (2013) with more than 960 men . Similarly, when taking medication, it should be thoroughly tested for their effects on fertility. Here, consultation with a specialist is recommended. As I have already described in my Article “Underwear Prevention for Men”, even a slight increase in the testicular temperature can inhibit sperm formation and thus significantly reduce the sperm quality. The factor of heat is becoming increasingly significant in times of seat heaters in cars and public transport. Since the turn of the millennium, nutrition has dramatically evolved into a high-carbohydrate and low-vitamin-poor diet. Long transport and increased fertilization of food mean that many foods lose more than 50 percent of their vitamins . There are numerous studies [2, 4] that show a strong correlation between diet and sperm quality. What can men do to improve their fertility? Deciding to have a child earlier has a noticeable impact on fertility. First, the aforementioned factors, such as diet, heat, alcohol and smoking, can have less long impact on our body. Secondly, the resulting children are more likely to reproduce, as they are most likely to be healthier and therefore more fertile. In my opinion, the risks of not being able to offer your child enough financially are much less likely in Germany than the likelihood of no longer having children if you decide too late. For this reason, I advise couples with a desire to have children, to have children earlier even if Childbearing is not for Cowards and not all the prerequisites besides the age are optimal. The use of seat heaters, the warm laptop on the lap, the regular sauna sessions as well as tight clothing can lead to heating of the testicle and thus inhibit the formation of sperm. For this reason, one should check one‘s habits and avoid any action that can cause the testicles to heat up. Those who have a desire to have children should Stop Smoking and avoid alcohol . Of course, this applies equally to pregnancy, as well as afterwards – when the child is born. Similarly, the consumption of unhealthy fast foods with many artificial additives should be avoided. Many men and women have very high emotional stress in the workplace – the pressure to perform has grown. To reduce stress, I advise men to engage in time management and work Psychology. For example, stress in learning and exam situations can be noticeably reduced by the Flow Effect. Likewise, in my opinion, Pressure is not equal to Stress. If I enjoy my job, I may feel the stress in the job even extremely positive and then produce advantageous hormones that positively affect my fertility. In the long term, a dietary change can help. Here, a dietician can help – accompany this path. Here you should pay particular attention to a vitamin-rich diet. There are numerous Vitamins, that improve the Spermiogram (e.g. Vitamin C, D and E). However, in addition to a medically accompanied dietary change, a Vitamin cure with vitamin supplements is possible in some men, which has been shown to increase sperm quality. If the study  is believed, then almost all men in developed nations are infertile in less than 50 years. However, I believe that if men and women still rethink today, it will not happen. First, a lot would really change if men and women choose to have children earlier. Shared fertility, in my view, would rise sharply as a result of an earlier decision for childbearing. With additional use of the Symptothermal Method, to determine the fertile and infertile days in the menstrual cycle, I even assume an improvement in the pregnancy and birth rate. However, men need to rethink and understand that they also have a biological clock ticking. How often do I hear from women that I would like to have children – but my husband still wants to wait. These men in particular should read this article. Secondly, men’s opportunities to improve their fertility, through diet change, healthier lifestyles, etc., are really positive. You want to learn more about it Only for a short time, there is a bonus pdf to our eBook „WHEN AM I FERTILE?” containing 10 ways to increase fertility in men naturally. This article also gives hope to men who want to improve their spermiogram at older ages, as the research into vitamin supplements etc. is very advanced. Overall, one can not explain this topic in an article – therefore, before you use any methods and means, always check with a specialist or expert. 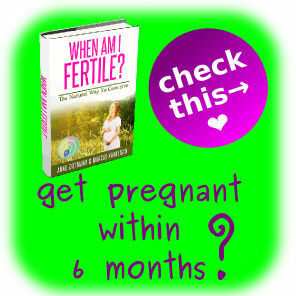 Pregnant Despite Period – Is that possible?